Aerial view of the Metyx Hungary site in Kaposvár. 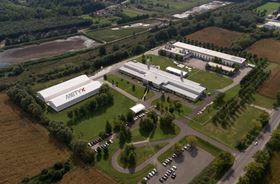 Metyx says that its composite facility in Kaposvár, Hungary, has been expanded, adding an additional 3,024 m2 of storage space for composite technical fabrics, packaging and fiber reinforced plastics (FRP) tooling. The extended warehouse has two areas. One section has racking for up to 1,300 tonnes of additional Metyx technical fabrics stock, including E-glass, carbon and hybrid multiaxial and woven reinforcementsm while the other section has been equipped to store and handle large-scale FRP master plugs, molds and components produced by the Metyx Group, typically for wind energy, marine, building and transportation customers in the EU. This latest expansion is part of the Metyx Group’s five-year growth plan for the Kaposvár site, announced in February 2018. ‘We are very pleased to be on track with the next expansion phase of our operations in Kaposvár, meeting our commitments to the Hungarian government,’ said Ugur Üstünel, co-director of Metyx. Metyx Hungary currently employs 199 people with six NCF (non-crimp fabric) production lines for glass and carbon reinforcement fabrics. Over the next five years, the company plans to extend the production facilities and infrastructure of the Kaposvár site, including increasing production capacity for producing glass and carbon fiber textiles, adding new NCF and weaving machines, and expanding the core kitting and component manufacture services from Hungary.